As processing teams at the Kennedy Space Center continue to prepare space shuttle Discovery for her next mission – STS-119 – early next year, the Program Requirements Control Board (PRCB) is pressing ahead with preparations for the busy 2009 flight year, with the baselining of the STS-129 mission. Currently targeting a launch date of October 15, 2009, STS-129 will see shuttle Discovery deliver the first two of five Express Logistics Carriers (ELCs) to the International Space Station (ISS), as well as return Canadian Space Agency astronaut, and ISS Expedition 20 Flight Engineer-4, Robert Thirsk to Earth. Discovery’s 37th, and currently second to last mission, will be a 15-day flight to deliver the ULF-3 (Utilization and Logistics Flight) launch package to the ISS. Discovery’s main payload elements are the ELC-1 and ELC-2 carriers. Tucked safely inside Discovery’s payload bay, ELC-1 and ELC-2 will be packed with numerous spare parts for various external ISS systems. The BCDU will serve two functions for the ISS, “charging batteries during isolation periods, and providing conditioned battery power to the primary power buses during eclipse periods,” notes the baseline presentation. The initial activation of the BCDU will include starting the DC/DC power converter, Local Data Interface, and control and monitoring circuitry. These systems will provide adequate protection for the batteries from anomalous power circuit faults that may occur. 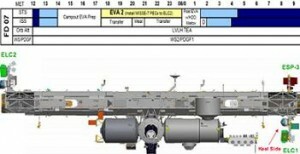 Another element traveling to space on ELC-1 that received special attention in the Baseline document is the Pump Module. Acting as “the primary ETCS heat transportation component, the PM Orbital Replacement Unit circulates liquid ammonia at a constant flowrate to a network of coldplates and heat exchangers located on the external trusses,” adds the baseline document. The ISS has two active PMs controlling two ammonia loops. One PM is located on the S1 truss (Loop A) while its counterpart is located on the P1 truss (Loop B). Also mentioned by the Baseline document is the Ammonia Tank Assembly. Serving as a storage place for ammonia for the ETCS, the ATA serves a variety of functions in conjunction with the PM – most notably the ability “to vent the PM and ATA” through a nonpropulsive vent. 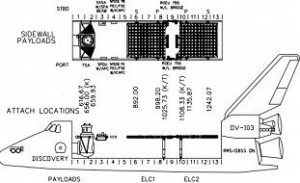 Additionally, the Plasma Contactor Unit is an integral part of the ISS design. “Two PCUs are mounted on the Z1 truss (and are) used to keep the electrical potential between the surrounding space plasma and the station structure from reach damaging potentials,” notes the PRCB presentation. The presentation goes on to explain that the PCUs “generate plasma from xenon gas and emit a stream of electrons into space.” These emissions basically ground the ISS to the environment of space, providing reduced hazards to ISS and her resident crew. Also hitching a ride on ELC-1 is a replacement Latching End Effector (LEE) for the Space Station Remote Manipulator System (SSRMS). Unlike the Shuttle Remote Manipulator System which only has one End Effector, the SSRMS has two LEEs, allowing the SSRMS the ability to “walk” along various grapple fixtures on the exterior of the Station. 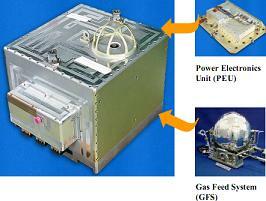 The LEE also has the ability to grab various PDGFs (Power and Data Grapple Fixtures) on the ISS. This allows the SSRMS to provide power and data to various powered payloads such as Dextre, the Canadian Special Purpose Dexterous Manipulator unit which was delivered to and assembled at the ISS by the STS-123 crew in March of this year. Similarly, ELC-2 will carry an additional NTA, CMG, PM, 2 additional PFRAMs as well as a High Pressure Gas Tank, Cargo Transport Container, Mobile Transporter/Trailing Umbilical System (MT/TUS), and Materials on International Space Station Experiments (MISSE) Flight Support Equipment. The two MISSE experiments – 7a and 7b – are still in the developmental stages and will be stored inside Passive Experiment Containers (PECs) on the sidewall of Discovery’s Payload Bay. 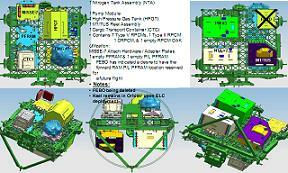 The MISSE experiments will later be installed on ELC-2 during one the mission’s EVAs. In addition to the payload on the ELCs, Discovery’s crew will also deliver a repaired S-band Antenna Sub-Assembly (SASA) which was returned to Earth during the STS-120 mission in October 2007. Also, the crew will transfer a General Laboratory Active Cryogenic ISS Equipment Refrigerator (GLACIER) from Discovery’s middeck to one of the ISS labs. As with all Shuttle missions, STS-129 flight designers have unique elements to consider as they lay out the mission’s flight plan. Most notably for STS-129 is the timing of the missions four EVAs. Centering around center of gravity (CG) concerns with ELC-1, missions planners are mulling over two options: the first putting EVA-1 on Flight Day-4 (FD-4) with ELC-1 unberth and attachment to ISS on FD-5; the second having ELC-1 unberth and attachment to ISS on FD-4 and EVA-1 on FD-5. “Worst Case forward CG results if the ELC-2 pallet is deployed first,” notes the PRCB baseline. This scenario would require filling Discovery’s lead ballast tank with an additional 2,000lbs, resulting in a significant decrease in upmass capability. However, this situation can be avoided by deploying the ELC-1 pallet first. This operation “requires a mission operational crew timeline constraint to remove ELC-1 first,” notes the baseline document. This constraint was approved by the FOICB and JMICB (Control Boards) in July 2007. With these considerations in mind, flight planners have assembled a preliminary outline for the first three EVAs of the mission. EVA-1 will see the transfer of SASA from the Payload Bay to the Z1 truss; EVA-2 will consist of installing the MISSE 7a and 7b packages to ELC-2, while EVA-3 will see astronauts install the High Pressure Gas Tank to the ISS Airlock. EVA-4 remains To Be Determined at this time. Also noted in the baseline document are the locations where ELC-1 and ELC-2 will be attached to the ISS. ELC-1 will be mounted on the lower P3 truss; ELC-2 will be mounted to the upper S3 truss. L2 members: All documentation – from which the above article has quoted snippets – is available in full in the related L2 sections, now over 400 gbs in size.